In a brief ceremony this afternoon at UN Headquarters, Mr. Benjamin Cohen, Acting Secretary-General, formally accepted on behalf of the United Nations 180 flowering cherry trees donated by Mrs. Albert D. Lasker, of New York, and her children. The trees were planted last year in the landscaped area north of the Conference Building. 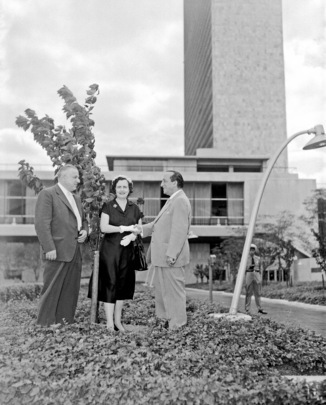 Seen here (l. to r.) in front of a cherry tree: Mr. Andrew W. Cordier, Executive Assistant to the Secretary-General; Mrs. Lasker; and Mr. Cohen.